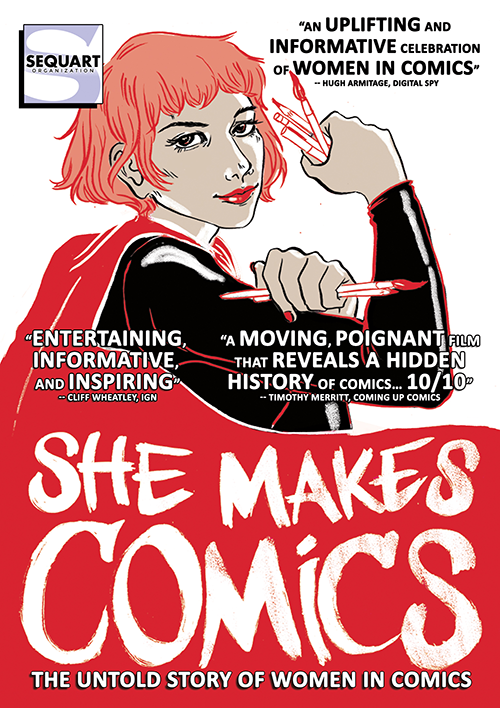 Sequart Organization and Respect Films are proud to announce that She Makes Comics is now available to stream from Netflix. Directed by Marisa Stotter, She Makes Comics traces the fascinating history of women in the comics industry. Despite popular assumptions about the comics world, women have been writing, drawing, and reading comics since the medium’s beginnings in the late 19th century. And today, there are scores of women involved in comics and its vibrant fan culture. Featuring dozens of interviews with such vital figures as Ramona Fradon, Trina Robbins, Joyce Farmer, Karen Berger, Wendy Pini, Colleen Doran, Kelly Sue DeConnick, Raina Telgemeier, and Becky Cloonan, She Makes Comics is the first film to bring together the most influential women of the comics world. The documentary has received rave reviews and won Best Documentary at the 2015 Comic-Con International Film Festival. Neil Gaiman: Dream Dangerously is available on Vimeo and Starz. The Image Revolution is available on Amazon Prime Video (and on DVD). Diagram for Delinquents, Grant Morrison: Talking with Gods, and Warren Ellis: Captured Ghosts are available on Sequart’s own online store. Chris Claremont’s X-Men is available on Amazon Prime Video and iTunes. Next Valiant and Humble Bundle Present the VALIANT UNIVERSE Bundle – Available Today!